A mother takes twenty years to make a man of her boy, and another woman makes a fool of him in twenty minutes. A person will sometimes devote all his life to the development of one part of his body - the wishbone. College is a refuge from hasty judgment. 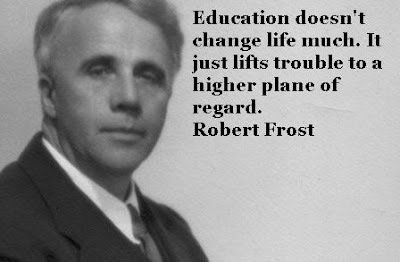 Education doesn't change life much. It just lifts trouble to a higher plane of regard. Forgive me my nonsense, as I also forgive the nonsense of those that think they talk sense. Humor is the most engaging cowardice. I alone of English writers have consciously set myself to make music out of what I may call the sound of sense. I never dared to be radical when young for fear it would make me conservative when old. If one by one we counted people out For the least sin, it wouldn't take us long To get so we had no one left to live with. For to be social is to be forgiving. If society fits you comfortably enough, you call it freedom. No memory of having starred atones for later disregard, or keeps the end from being hard. One aged man - one man - can't fill a house. Space ails us moderns: we are sick with space. Talking is a hydrant in the yard and writing is a faucet upstairs in the house. Opening the first takes the pressure off the second. The father is always a Republican toward his son, and his mother's always a Democrat. The only way round is through. The world is full of willing people; some willing to work, the rest willing to let them. We dance round in a ring and suppose, but the secret sits in the middle and knows.